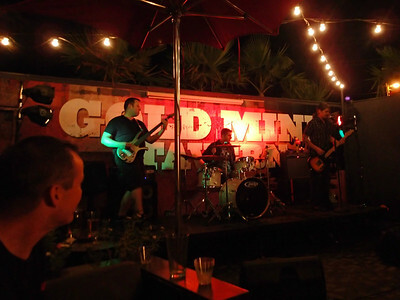 Last Friday night, we went to Gold Mine Tavern to see, our friend's band, Priceless Advice. It's a small bar in downtown Henderson, we've been once before for a Dirty Heads after party. Back then, the venue didn't have outdoor space. The patio was such a pleasant surprise. It an open air, cozy space with tables, couches and heaters. It's also where bands and comedians perform. Priceless Advice put on a Nirvana Tribute show featuring music from In Utero. They got a late start, but they sounded great and it was a good time. The bar had some good choices on tap, which is always a bonus - Sculpin IPA flowed all night. I love these small bars that host local bands.